Edward Droste (born October 22, 1978) is an original member of the Brooklyn-based indie-rock group Grizzly Bear. The group began as the solo effort of Droste with the release of 2004's Horn of Plenty, originally released on Kanine Records. All songs were written and performed by Droste. By 2005, the group expanded into a four-piece, with Droste still as a contributing songwriter. Droste was born in Massachusetts, the son of Diana (née Forbes) and Bruce F. Droste. His maternal grandfather was conductor and musicologist Elliot Forbes. Through his mother's Forbes line, he is related to singer China Forbes. He attended elementary school at Shady Hill School in Cambridge, Massachusetts, where his mother is a music teacher, and high school at Concord Academy in Concord, Massachusetts. He attended Hampshire College for one year in 1999 before transferring to and graduating from New York University's Gallatin School of Individualized Study in 2003. 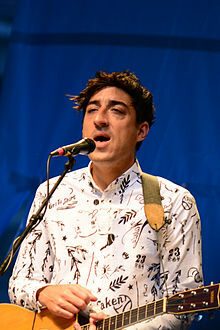 Droste began composing and performing songs on a solo basis as Grizzly Bear, releasing the album Horn of Plenty in 2004, with some contributions from drummer Christopher Bear. The two then joined with Chris Taylor, and eventually Daniel Rossen, to form the current four-piece band. Droste has said of the gestation of the band, "Daniel [Rossen] and I are the principal songwriters, but we also have the most issues with being performers. I strongly reject the notion that I have to do stage kicks or be some sort of persona. I respect artists that have an act, a look, a shtick. That’s all fine and dandy, but with our songs, it would feel like the biggest farce. It took us a long time to get comfortable; the whole thing was four people growing into each other." April 2007 - Edward appeared as a guest vocalist on "To a Fault" from Dntel's fourth album, Dumb Luck released on Sub Pop Records. September 2007 - Edward sang with Beirut in the video for their song "Cliquot" for La Blogothèque's video series. March 2008 - Edward joined Owen Pallett to cover Björk's "Possibly Maybe" for Stereogum.com's tribute to Björk's album, Post. February 2011 - Edward collaborated on the song "I'm Losing Myself" with Fleet Foxes frontman Robin Pecknold in Los Angeles. May 2016 - Edward and Little Joy's Binki Shapiro collaborated on a cover of the Grateful Dead song "Loser" for the Grateful Dead tribute album Day of the Dead (2016 album). In September 2011, Droste married his long-time boyfriend, interior designer Chad McPhail. On August 4, 2014, Droste announced his divorce from McPhail via Twitter, stating that he's "amicably and lovingly divorcing [his] husband". Droste was featured on the cover of Hello Mr. in 2013. Edward is a second cousin on his father's side to another Ed Droste, who is a co-founder of the Hooters restaurant chain. ^ Cobb, Nathan (1998-04-14). "Live Wired Intense Educator Bruce Droste Is Juiced Over His New Venture, The On-Line Virtual High School". Pqasb.pqarchiver.com. Retrieved 2013-04-04. ^ Wakin, Daniel J. (2006-01-14). "Elliot Forbes, 88, a Scholar Whose Specialty Was Beethoven, Dies". The New York Times. ^ Music (2008-04-24). "The Pink Martini girl gets serious". London: Telegraph. Retrieved 2013-04-04. ^ Moody, Rick. "Edward Droste", BOMB Magazine, Summer, 2010. Retrieved August 1, 2011. ^ "Watch here". Dailymotion.com. 2007-09-25. Retrieved 2013-04-04. ^ "Enjoyed: A Tribute to Post". Stereogum.com. Retrieved 2013-04-04. ^ "Listen to Ed Droste and Binki Shapiro's Cover of the Grateful Dead's "Loser"". pigeonsandplanes.com. Retrieved 2016-06-06. ^ , Retrieved January 8, 2011. ^ Martin, Andrew (December 16, 2011). "Grizzly Bear Returning Full-Time In 2012". Complex. ^ , Retrieved August 4, 2014. ^ "Pick up your copy of Hello Mr. Mag which features the interview above with coverstar Ed Droste". Grizzly Bear Galore. Retrieved 20 September 2016. "While You Wait for the Others"
This page was last edited on 15 February 2019, at 20:53 (UTC).